Is Christ at Home in You? Paul, the Apostle, wrote this prayer for the believers at Ephesus, and for us today also. When we become Christians we are new creations. We are born again. Our old dead self (we were dead in sin) is raised to new life. The Holy Spirit comes and lives within us. It is truly a miracle work of God. We are studying Ephesians 3 in church, and I’ve been thinking about this verse a lot this week. 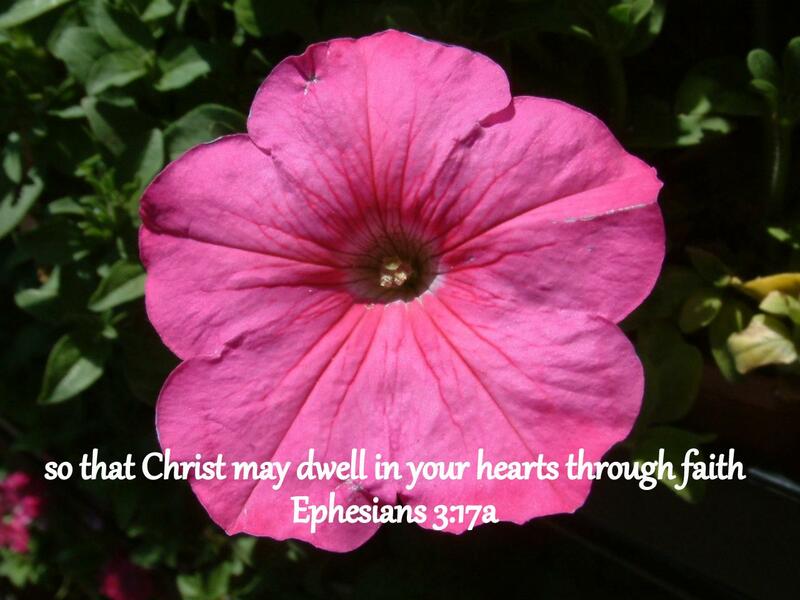 What was very interesting to me, as our pastor unpacked this verse, was the word “dwell.” In the Greek this word means settled down in you, or comfortable there, or at home in you. It also indicates a permanent residence. Is Christ at home in you? Is He comfortable, or do we make Him feel uneasy and unwelcome? Those are good questions, so I’ve been pondering what would make Christ NOT feel at home in me. The short answer: sin. Even though I’ve been born-again and am now a new creation, I still live with the old flesh. I can still sin. And as the Bible tells us the heart is very deceitful. I might think I’m a pretty good person as I haven’t committed adultery, and I’ve never murdered anyone. But, in reality, I actually sin every day. I think we sin mostly in our minds and attitudes. Sin is born in the mind. Temptations surround us all day long in this world. We hear gossip and even partake in it. We watch things on television that corrupt our minds. We need to be careful of what we watch and listen to. Jerry Bridges wrote an excellent book for Christians called, Respectable Sins: Confronting the Sins we Tolerate. Some of the sins he tackles are: Ungodliness, anxiety and frustration, discontentment, unthankfulness, pride, selfishness, lack of self-control, impatience and irritability, anger, judgmentalism, envy, jealousy, sins of the tongue, worldliness. That is quite is list isn’t it? I see myself there do you? I highly recommend this book. It will help you see things that are sinful that you might not have never thought of before. So, what happens when a Christian sins? Well, we don’t lose our salvation, but Christ does not feel at home in us that is for sure. I wonder how many times a day I make him feel unwelcome. It makes me sad to think that I offend Christ in me. When I realize it I do pray and ask forgiveness. In order to have victory in our lives we must keep that connection with Jesus open. When I know I’m having company I work hard to clean up my house and have everything in order. Then, when they are with me I try very hard to make them feel welcome. I entertain them and don’t do or say things that might upset them. But, just think, the God of all creation, the King of Kings, comes and resides within us. He doesn’t just come for a visit, but he sets up a permanent residence in us. What an awesome thought! Joh 14:23 Jesus answered and said to him, “If anyone loves Me, he will keep My word; and My Father will love him, and We will come to him and make Our abode with him. I need to work on making our wonderful, blessed, Savior at home. We are told that our bodies are the temple of the Holy Spirit. Is my body fit for a King? I think it needs cleaning up on a daily basis in order for the King to feel at home. What about you? Maybe that is why we don’t feel like we are living the victorious Christian life. Maybe there are things blocking us from having an intimate relationship with Christ. We lose our power when we grieve the Holy Spirit. You can start by taking inventory. First think about what you think about. Sounds kind of odd right? Take a look at Philippians 4:8 and you will see that God has already told us how we should think. Php 4:8 Finally, brethren, whatever is true, whatever is honorable, whatever is right, whatever is pure, whatever is lovely, whatever is of good repute, if there is any excellence and if anything worthy of praise, dwell on these things. Check yourself this week and determine what you are thinking about. Are they things that this scripture tells us we should be thinking about, or is your mind full of other things. You might be spending a lot of time with thoughts about someone you are angry with rehearsing over and over what you would like to tell that person if you got a chance. Or, you might be letting your mind wander into impure thoughts. Maybe you watched something on television that started your mind in that direction and now you are dwelling on them. There are so many things we think about that we shouldn’t really. They are things that tear us down and don’t build us up in the Lord in any way. When we struggle with our thought life and entertain thoughts that we shouldn’t sooner or later we give birth to sin. Our Precious Lord cannot feel at home in these kinds of situations. I don’t think we realize how much of an effect we have on Christ in us. Oh Lord, please help me to understand the deep things Paul is trying to teach me, and help me to have a clean heart, so that Christ can dwell in me and be comfortable. Help me not to offend Him. In Jesus Name. Amen.